[Bible, Latin Vulgate. Ca. 1455]. Biblia Latina. [Mainz: Johann Gutenberg, ca. 1455]. The first substantial printed book in the West is this royal-folio two-volume Bible, comprising nearly 1,300 pages, printed in Mainz on the central Rhine by Johann Gutenberg (ca. 1390s-1468) in the 1450s. It was probably completed between March 1455 and November of that year, when Gutenberg's bankruptcy deprived him of his printing establishment and the fruits of his achievements. Substantial parts of the Bible had been seen at Frankfurt in October 1454 by Aeneas Sylvius Piccolomini (he would become Pope Pius II in 1458), who in March 1455 wrote about what he had seen. He praised the very neat and clear letters to a fellow-cardinal at Rome, Juan de Carvajal, telling him how easy it was to read without eyeglasses, and mentioned that the entire production run had been fully subscribed. By then at the court of the Emperor Frederick III near Vienna, where further printed gatherings had arrived, he was certain that the book was finished. His sources spoke of both 158 and 180 copies. Subsequent scholarship interprets these figures as reflecting original projections and subsequent increased demand; manifest instances of sectional reprinting in the surviving copies lend credence to this explanation. Forty-eight integral copies survive, including eleven on vellum, Perhaps some 180 copies were originally produced, including about 45 on vellum. The Lenox copy, on paper, is the first Gutenberg Bible to come to the United States, in 1847. Its arrival is the stuff of romantic national folklore. 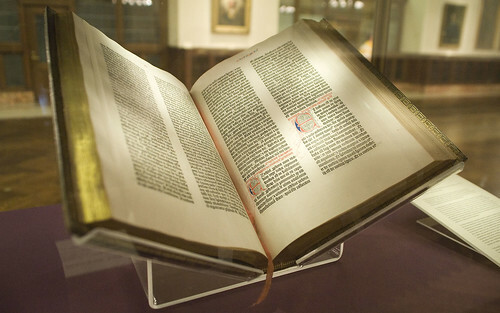 James Lenox's European agent issued Instructions for New York that the officers at the Customs House were to remove their hats on seeing it: the privilege of viewing a Gutenberg Bible is vouchsafed to few.